Governor Deval Patrick’s administration has struck a deal to allow construction of Fenway Center, a $500 million mega-development in Boston that would transform scrubby parking lots near the storied ballpark into a bustling complex of homes, stores, offices, and parking. If, as expected, a state board approves the lease next week, construction could begin by the end of this year. Fenway Center, one of the city’s most ambitious developments, would be the first major air rights project over the Massachusetts Turnpike since Copley Place in the 1980s. The Patrick administration ironed out a tentative lease with the developer, John Rosenthal, that would give the state $226 million in rent for a 99-year lease of 4.5 acres of state-owned land and the air rights. 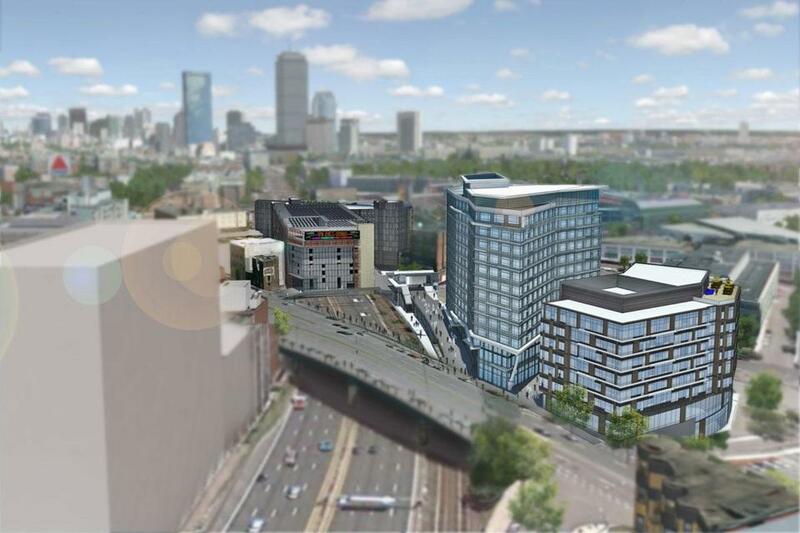 Fenway Center’s five buildings would include 550 apartments, plus stores and restaurants, parking garages, and a 27-story office-retail-residential complex. Most would be constructed on weed-strewn parking lots between Beacon Street and Brookline Avenue that many Red Sox fans walk through on their way to and from the ballpark. The complex would also complement a remarkable amount of redevelopment underway along Boylston Street on the other side of the ballpark. Fenway Center would be eye-catching in many ways. Its main parking garage will straddle the turnpike and will be topped with enough solar panels to power a new commuter rail station that is under construction at the property’s edge. A second building over the turnpike, to be built later, will rise 27 stories and include stores, offices, and 120 apartments. A community center, farmers market, bike-sharing station, and pedestrian and bike paths to the district are also planned. Yawkey Way, a street outside of the ballpark that is closed to vehicles during baseball games, would be extended across Brookline Avenue into the development site. A Patrick administration official said the sides ironed out a “fair deal” that will result in significant revenue for the state as well as 1,800 construction jobs. A major issue in the negotiations was the value of the air rights. “This project will be transformative both physically and economically for this region,” said Dana Levenson, chief financial officer for the Massachusetts Department of Transportation, which handled the lease negotiations. He said the lease includes an upfront payment to the state of $5.5 million, with the remainder to be paid over the 99-year term. The lease will be presented to a Transportation Department financial panel Tuesday and is scheduled to go before the agency’s board of directors May 22. The development is expected to produce about $5 million a year in property taxes for the City of Boston. Rosenthal said that by early next year he will start building about 420 apartments and retail stores in three buildings. Two buildings — of seven and 14 stories — will rise on Beacon Street, and a seven-story apartment and retail building will be constructed along Brookline Avenue. That work will include construction of a 750-space parking garage that will be leased to tenants in the nearby Longwood Medical Area and will provide parking for Red Sox fans and other visitors. The commuter rail station, on the Massachusetts Bay Transportation Authority’s Framingham/Worcester Line, is scheduled to be completed by the end of 2013. Fenway Center’s second phase of construction, which includes the 27-story building, is planned to begin several years from now. 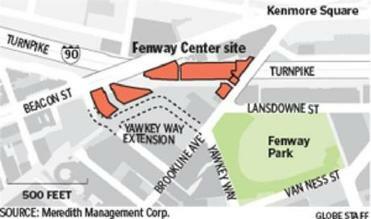 On the drawing boards since 2007, Fenway Center has suffered numerous setbacks. First it was delayed by a soft economy and then became entangled in a a lawsuit with an abutting property owner who objected to its size and layout. Rosenthal prevailed in that suit last year, but lease negotiations with the state dragged on longer than expected. Still, Rosenthal said he is confident the project will move forward. He is partnering with Bentall Kennedy Group, a real estate investor that has bankrolled projects in major US and Canadian cities. The firm, whose investment clients include the California Public Employees’ Retirement System and Delta Airlines, has funded several large office projects in Boston and its suburbs, including a major renovation of the former Verizon building in downtown Boston; that building, on Franklin Street, was recently leased by Brown Brothers Harriman. A spokesman for Bentall Kennedy said Fenway Center offers an opportunity to bring new amenities to the fast-growing neighborhood, which has attracted a burst of development that has remade much of that section of Boylston Street.